Disclaimer: The following article provides an overview of the medical coding and billing systems used in the U.S. as part of the traditional fee-for-service billing model. It does not cover durable medical equipment, clinical lab diagnostic testing, or nursing home charges. The path to medical device commercialization in the U.S. is long and complex with many hurdles. The two most significant challenges are obtaining FDA approval and positive coverage decisions from payers. The most important players in these coverage decisions are Medicare (which accounts for 20 percent of national healthcare expenditure) and large commercial insurers, such as Aetna, Anthem, Cigna, Humana, and United Healthcare. Although FDA approval usually precedes reimbursement decisions, companies are advised to formulate strategies for both in tandem, and then synchronize them with R&D, clinical studies, and marketing plans to maximize the potential for commercial success. Table 1 describes the various codes used for billing of inpatient and outpatient procedures. In the U.S., physicians and healthcare facilities are paid separately. Physicians bill for the procedures they perform, and are paid differently depending on whether they performed the procedure in a facility setting (e.g., hospital) or a non-facility setting (e.g., office or clinic). Facility rates for physicians generally are lower than non-facility, since the facility provides support and infrastructure for the service bills, and separately for the procedure, while physician offices or clinics cover all costs associated with the procedure. Hospitals receive a single bundled payment that covers all costs (except physician services) associated with an individual’s inpatient care, regardless of how many procedures were performed. Outpatient facilities receive different payment depending on whether they are considered outpatient hospital centers (APC) or stand-alone ambulatory surgical centers (ASCs). Unlike inpatient services, outpatient facility payments are not bundled, and facilities can bill for multiple procedures at one time. Used for inpatient billing only. The DRG code encapsulates all hospital services and associated costs incurred during a patient stay EXCEPT physician charges; these are billed under CPT. Only one DRG code is used per admission. The DRG is determined by the patient’s reported ICD-10-CM code(s). DRG 023- Craniotomy with Major Device Implant/Acute Complex Central Nervous System Principal Diagnosis with major complication or comorbidity, or Chemo Implant. HCPCS codes have numerous functions. They are used to bill procedures and healthcare products, as well as to track performance. There are two levels (Level I and Level II), which are maintained by separate entities. Level I HCPCS codes are called Current Procedural Terminology (CPT) codes and have three subcategories. Level II HCPCS are used to bill for products, supplies, and services not covered in the CPT code. Level I HCPCS (CPT Codes) are used to bill for procedures and services performed by physicians and other healthcare professionals. Category I – Physicians bill for procedures or services they perform in inpatient and outpatient facilities using this code. Payment goes to the physician. CPT 37184 – Primary, percutaneous transluminal mechanical thrombectomy, noncoronary, arterial or arterial bypass graft, including fluoroscopic guidance and intraprocedural thrombolytic injection; initial vessel. Category II –Performance measurement codes, use is optional, no monetary value attached. 4000F-4124F- Therapeutic, preventative or other interventions. [Codes in this range describe pharmacologic, procedural or behavioral therapies including preventative services such as patient education]. Category III –Temporary codes used to track utilization of new or emerging medical technologies, services or procedures. Payments may be negotiated with each payer. 0306T – Interrogation device evaluation of intracardiac ischemic monitoring system with analysis, review and report. Level II HCPCS are used for products, supplies and services supplied outside the physician’s office. These codes represent over 4,000 categories of items, used primarily to identify products, supplies, and services not included in the CPT code. C codes – items and services for outpatient use, pass-through devices, drugs and biologicals, new technology and other services. G codes- professional healthcare procedures and services which currently lack a CPT code. Q codes – used to identify drugs, biologics and other medical equipment or services which are not identified by national level II codes but which need coding for claims processing purposes. S codes – used primarily by private insurers to report drugs, services and supplies for which there are no permanent national codes, but for which codes are needed to implement policies, programs or claims processing. G0259 – Injection procedure for sacroiliac joint, arthrograpy. Q4102 – Oasis skin matrix, per square centimeter. Ambulatory Surgical Center (ASC) Payment System. Used for procedures performed in ASCs. ASCs are standalone centers that perform same-day discharge services only. There are no specific ASC billing codes; CPT codes are used to bill for procedures. Payment goes to the facility. Hospital Outpatient Prospective Payment System (HOPPS), also referred to as APC. Used for procedures performed in hospital outpatient facilities. The HOPPS system provides Ambulatory Payment Classification (APC) codes, which are used by facilities to bill for outpatient procedures and services. CPT codes typically are used to ‘crosswalk’ to the APC fee schedule. Diagnosis codes are used to justify inpatient and outpatient billing. Defined in ICD-10-CM (Clinical Modification) manual, used to identify the patient diagnosis. 163.311 – Cerebral infarction due to thrombus of right middle cerebral artery. Procedure codes are used in inpatient billing. Defined in ICD-10-PCS (Procedure Coding System) manual, used to report surgeries or procedures performed in the inpatient setting. 03CG3ZZ – Extirpation of Matter from Intracranial Artery, Percutaneous Approach. The existence of a billing code, such as a Level I CPT code, does not guarantee that payers will provide payment for the procedure, nor does it ensure that they will cover every FDA-approved device for that indication. 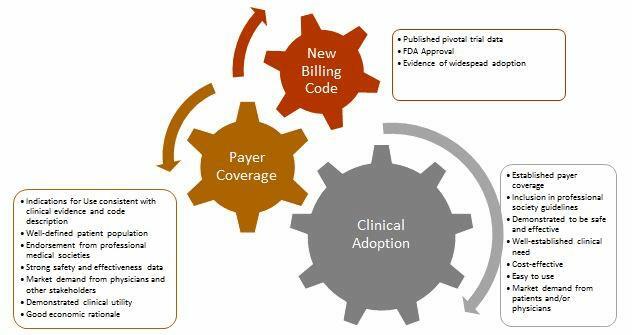 When a new procedure billing code is established, insurers base coverage decisions on a myriad of factors, including independent health technology assessments (which evaluate all available technical and scientific evidence supporting the intervention), peer-reviewed published clinical data, real-world evidence of clinical efficacy (outside a clinical trial environment), and practice guidelines published by relevant professional societies. Most companies initially attempt to obtain coverage from CMS, in part because it covers all adults age 65 and over in the U.S., but also because commercial insurers frequently follow CMS’s lead when it comes to coverage decisions. Rather than try to obtain coverage from the hundreds of U.S. commercial insurers, companies are advised to initially target a small number of payers — based on member enrollment, their receptiveness to new medical technologies, and the stringency of their review policies — and then gradually expand to other payers as adoption increases. Noncovered devices or procedures often are deemed “investigational,” which typically means that the payer has determined it lacks sufficient evidence to justify the product’s use. The scope of clinical evidence required by payers often exceeds FDA requirements, which focus on the device’s safety and efficacy. Companies should formulate regulatory and reimbursement strategies in tandem, to ensure that clinical studies are designed with both end goals in mind. In many situations, a new technology is billable under existing codes, but the associated payment will not adequately cover costs associated with the technology’s use; consequently, hospitals and providers may be unwilling to adopt it. To overcome this, companies may seek to establish a new billing code that provides higher reimbursement, work with providers to request additional coverage under existing codes, or request temporary pass-through payments. For example, CMS provides companies with the option of applying for a New Technology Add-On Payment (NTAP) to cover the cost of new medical technologies deployed in the inpatient setting. If approved, CMS pays a marginal cost factor — 50 percent of the cost of the new device or technology, or 50 percent of the overall incremental costs associated with the new technology, in addition to the full DRG payment. CMS also provides the opportunity for companies to apply for pass-through APC payments for hospital outpatient procedures. These payments are reserved for new, expensive-but-highly-beneficial devices that are used in procedures with existing APC codes. The pass-through typically is calculated as the cost of the device, minus the cost of the device already included in the APC that is being replaced. Companies also can apply for a category III (temporary) code while they await issuance of a category I CPT code for their new medical technology or procedure. This provision allows companies to build a history of widespread usage with the AMA that will support establishment of a CPT I code. However, no set payment fee will be established, and it can take years to transition to a category I code. Furthermore, companies run the risk that their device or procedure will be labelled experimental, potentially disqualifying it from coverage by some payers. Alternatively, companies can use a miscellaneous CPT code while they wait for a category I code. Miscellaneous codes provide a mechanism for providers to submit claims for a service or item as soon as it is FDA-approved. Miscellaneous codes exist for most organs or body systems (e.g. CPT 38999 – Unlisted procedure, hemic or lymphatic system). When a miscellaneous code is used, the healthcare provider must provide additional documentation justifying use of the device as part of their attempt to obtain coverage. This typically involves writing a lengthy procedure note describing the patient’s medical condition, the procedure itself, a list of all supplies used, rationale for using the new procedure or technology, and supporting clinical data. Payers then decide whether to provide any coverage for the procedure. The path to widespread clinical adoption and payer coverage for new medical technologies involves numerous stakeholders, including patients, physicians, healthcare providers, professional medical societies, and the agencies that establish and maintain the various coding systems. Each stakeholder plays an important role in the successful commercialization of a new product or procedure. Patients form the basis of the clinical need and, along with patient advocacy groups, can be important drivers of the adoption of new medical treatments. The recent approval of Sarepta’s drug treatment for Duchenne muscular dystrophy (DMD), and efforts by the Juvenile Diabetes Research Foundation’s (JDRF)to bring an artificial pancreas to market and ensure coverage, are good examples of this. Physicians have to be willing to use the procedure or device both in real-world clinical practice and as part of clinical trials, as well as advocate for its adoption with their employers and peers to support market demand. Healthcare providers, such as hospitals and clinics, have to be willing to try new procedures and devices, despite potential burdens it may thrust upon their clinical and administrative staff. Professional medical societies must be open to updating their guidelines to include new and innovative products once sufficient clinical evidence has been provided, as this is a huge driver in securing coverage from payers. The coding agencies (CMS, AMA) must be willing to work with other stakeholders to create or amend existing codes when necessary to efficiently support adoption of new, beneficial technologies. Payers need to work with medical device companies and providers to provide fair and equitable coverage for their innovative products. Successfully commercializing a new medical device or technology is a complicated endeavor. While no one can dispute the complexity associated with gaining FDA approval, too many companies underestimate the barriers associated with securing payer coverage. As early as possible, medical device companies need to research the market landscape for their products and develop an integrated strategy that identifies a path to clinical adoption and broad payer coverage. Companies must align their R&D, clinical, regulatory, reimbursement, and sales and marketing strategies to a common goal, and have a clear understanding of the challenges ahead in order to succeed. 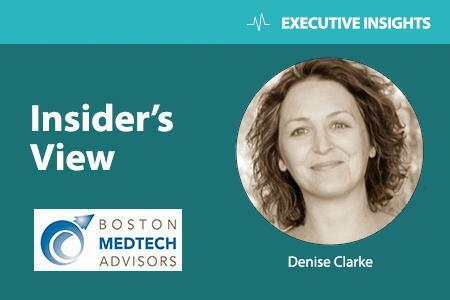 Denise P. Clarke is Senior Consultant at Boston MedTech Advisors, where she helps early and mid-stage life science companies successfully bring their products to market by developing holistic business strategies tailored to optimize a product’s unique value proposition and overcome complex challenges. She has over 16 years’ experience in healthcare and new product development. Please feel free to email her at dclarke@bmtadvisors.com with any questions or comments.